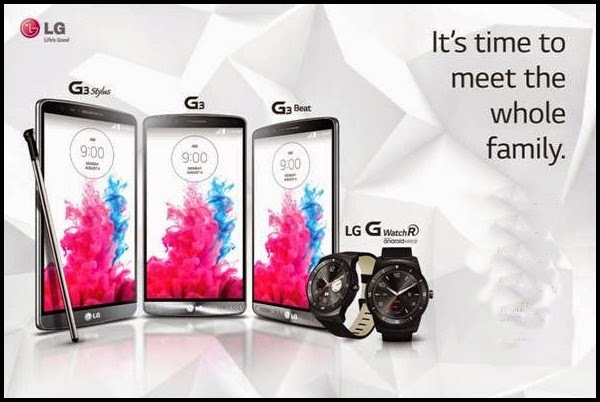 With the success of LG Electronics' new flagship LG G3 smartphone, the leading electronics innovator once again excites the Filipino with the arrival of more affordable smartphones from its G3 series, the G3 Stylus and the G3 Beat, together the LG's world’s first watch-style wearable. The G3 Stylus, LG’s new pen-enabled smartphone that inherits the core DNA of the acclaimed LG G3, brings a premium Stylus experience in a smart priced package. LG’s proprietary RubberdiumTM stylus pen slides inside the G3 Stylus, which feels comfortable in any hand and complements the phone’s 5.5-inch large display. Pair it with LG’s QuickMemo+ to take notes or draw directly on images or maps in a breeze. The stylus is also compatible with a number of third-party handwriting and drawing apps. The G3 Stylus will be offered in dual SIM with near field communication (NFC) capability in three colors: Black, White and Gold.LG’s newest stylus-powered device is priced at Php16,990, half that of a comparable premium smartphone with stylus pen, allowing consumers to enjoy a premium stylus experience at a more affordable price. The LG G3 Beat offers impressively thin bezels and a robust 2,540mAh battery. The LG G3 Beat features the Floating Arc Design first unveiled on the LG G3, boasting smooth curved sides and gradually tapered edges for the ultimate comfort in grip and feel. Available in Metallic Black, Silk White, Shine Gold, Filipinos can now have the G3 experience at half the price with the G3 Beat at P13,990. Both the G3 Beat’s and G3 Stylus’ 8MP and 13MP shooters, respectively, carry over the G3’s key camera features such as Touch & Shoot, Gesture Shot and Front Camera Light. Additional UX features that have become standard offerings across LG’s newest smartphones include Dual Window, Smart Keyboard and Knock CodeTM. Both also have the same Floating Arc design with gradually tapered edges, thin bezels and metallic skin back cover that was first introduced on the LG G3. Both devices also sport the revolutionary rear key. The G3 Beat and G3 stylus will exclusively be available at Abenson and MemoXpress stores nationwide. All other dealers and concept stores will soon carry these two new smartphones starting this month. This is the world’s first watch-style wearable to feature a fully circular Plastic OLED (P-OLED) display at 1.3 inches, taking advantage of every pixel and producing images of stunning color and accurate viewing at all angles even under bright sunlight. LG G Watch R features a classic design encased in durable stainless steel and aluminum powered by a 410mAh battery, the largest in an Android Wearable to date. It delivers optimal performance through its powerful but efficient 1.2GHz Qualcomm®Snapdragon™ 400 processor with 4GB of storage and 512MB of RAM, and is completely protected from dust and water resistant for up to 30 minutes at a maximum depth of one meter. For more information about LG’s newest G3 Stylus and G3 Beat, and G Watch R, visit www.lg.com/ph, www.lgblog.com.ph, orwww.LGnewsroom.com; like LG Mobile’s official Facebook page ‘LG Mobile Philippines’; or follow @LGPhilippines on Twitter and Instagram.